For the first time in a generation, cars account for most growth in travel in New York City instead of transit, as Uber and Lyft crowd the streets, according to a new report from Bruce Schaller. Growing congestion and declining transit ridership are symptoms of a transportation system in distress. But at a moment when transit in NYC desperately needs smart stewardship to meet rising travel demand, the city’s political leaders, especially Governor Andrew Cuomo, are nowhere to be found. Many of the 200,000 healthcare workers 1199 represents take transit to work because it’s the only affordable option. But unreliable service costs them time, said Cariño-Higgins, with trips that should take 15 or 20 minutes according to the schedule often dragging out to 50 minutes or an hour. New York is also a city where employers draw enormous benefits from the massive pool of people who can reach central locations thanks to the efficiency of the transit system. If that system can’t keep up with rising travel demand, said Ward, the city’s economic engine will start to sputter. The improvements Schaller has in mind are systemwide: modern subway signals that let trains run closer together, faster bus boarding and fare payment, and more bus-priority treatments on city streets. Meanwhile, Cuomo has spent much of his tenure pushing highway and bridge projects, transit boondoggles, and tech gimmicks. When the governor wants to expedite an important project, he can — witness the race to get the Second Avenue Subway into service by Cuomo’s deadline. But the governor has shown none of the same urgency for systemwide improvements that would speed trips for all riders and increase capacity across the board. The MTA started testing a modern, high-capacity signal system in the 1990s, for instance, and awarded a contract to Siemens to start implementation in 1999. Nearly two decades later, modern signals are fully operational on just one subway line. And when advocates raised alarms about declining bus speeds and called on the MTA to commit to faster fare collection technology across the system, Cuomo did nothing, and the agency dragged its heels. Without a governor focused on improving the daily experience of riding the trains and buses, for-hire vehicles will continue to fill the vacuum and gridlock will get worse. At the prices charged when I was there a decade ago, NYC Transit can’t afford to replace its signal system. The only hope is a breakout away from the old contractors and ways of doing things. If only it were possible to get those working on self-driving cars interested in trains. We’ve had the means for self-driving trains since probably the 1960s. Self-driving car technology might be useful when applied to street-running light rail, but it’s probably not so useful with the subway. the city can take the reins and quickly improve most NYrs mobility for pennies without begging Albany. 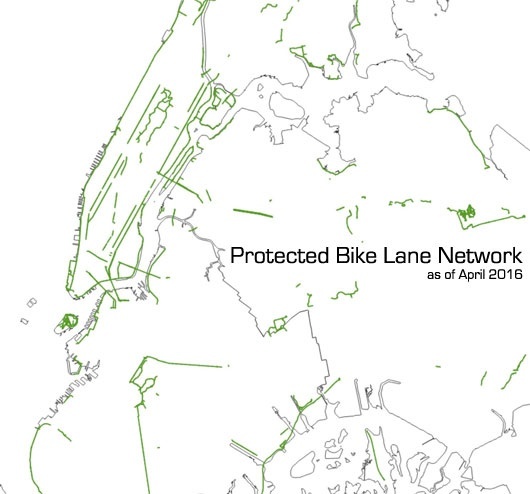 Build 50 miles of Protected Bike Lanes annually until 10% of streets have PBLs. This would cost a mere $25 million annually. 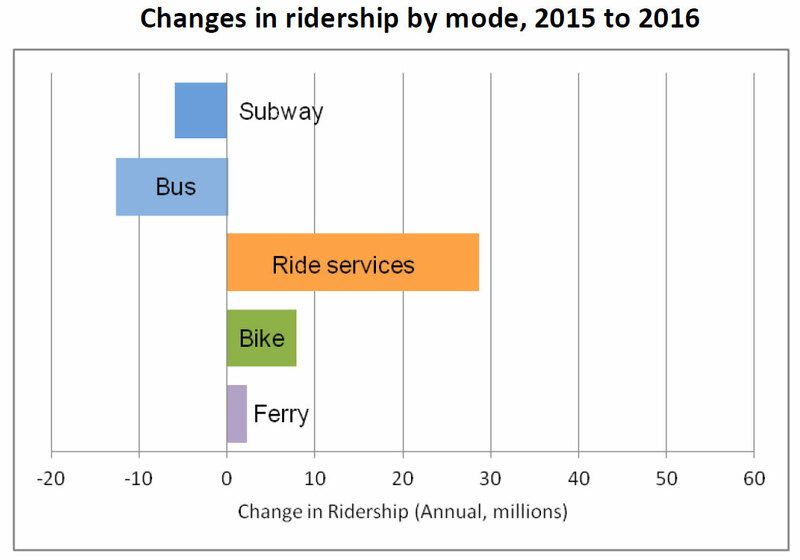 I’ll argue that a real network of PBLs will reduce car trips by nearly 1 million per day as well as reduce subway overcrowding. Sure, not every subway rider can get around cycling, but 75-85% can and would if the city provided PBLs. Currently, the city builds 5-15 miles of PBLs every year. The goal should be 50 miles per year. People need to stop citing the overall decline in subway ridership from 2015 to 2016 without noting that the decline was solely due to weekend ridership. Weekday ridership continued to increase! It may actually be the relative lack of congestion on weekends that has spurned people to avoid the MTA’s awful weekend subway service and choose other options such as rideshare, biking, or just walking. People are still taking the subway to work, especially in Manhattan, because it remains the best option, but for running errands, heading out for dinner, meeting up with friends, they’re abandoning the unreliable transit system for the increasing number of other options available. Most techies who are interested in self-driving cars have no patience for working with the slow, unwieldy bureaucracy of public transit agencies. They want to test their driverless cars out in the desert in Nevada and start the factory going to make a profit within their lifetime. Forget Upstate Legislators - Why Don't NYC Dems Advocate for Better Transit? New York City's own contingent in the state legislature is the bigger stumbling block to better transit.